David Rosenberg is co-founder of experimental theatre company Shunt. His productions include Electric Hotel, Contains Violence and Ring. His newest show Motor Show, a collaboration with the choreographer Frauke Requardt, plays at Brighton Festival from May 9th-13th. 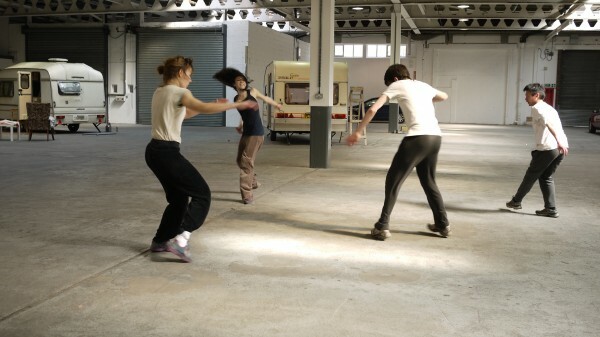 Electric Hotel, directed by David Rosenberg and choreographer Frauke Requardt, was a big hit at the 2010 Brighton Festival. This year, the pair returns to the city by the sea with the world premiere of Motor Show, an outdoor performance piece that will take place on wasteland. Speaking on the phone from a huge car-filled warehouse in Bermondsey, which is doubling as the show’s rehearsal space, Rosenberg tells me why he was so keen to go back. “It’s a fantastic arts festival with the strongest support of outdoor work. And it’s by the sea! It’s so difficult to get out of London when you live here. This is my opportunity to get a bit of sea air – and then fill it with exhaust fumes”, he laughs. If any production needed the space afforded by being outside, the gas-guzzling Motor Show is it. As headphone-wearing audiences look on and eavesdrop, cars will approach in the distance; their occupants loving, fighting and reconciling as the sky above darkens. This is a continuation of the work Rosenberg and Requardt started with Electric Hotel, which put audiences in the Rear Window-ish position of glimpsing private lives unfold through the windows of a hotel. “Once again, we’re interested in an audience looking into personal spaces,” he explains. “But rather than hotel rooms, these personal spaces are the interiors of cars. And although we’re working with a much greater distance, it will sound as though you are inside the vehicle. It’s exciting to try to create an intimacy that crosses such a huge physical gap.” This touches on something evident in Rosenberg’s work since he co-founded the experimental Shunt collective in 1999: his interest in challenging theatrical expectations and exploring theatre’s nascent voyeurism. From the Hitchockian Contains Violence (2005) onwards, the use of headphones has been one of Rosenberg’s ways of grappling with the issue. And recently he participated in a podcast on ‘The Ear’ for Fuel, who produced both that show and Electric Hotel, which also utilised earpieces. So where does his fascination with the relationship between hearing and theatre originate?